Comments: ALTERNATE EDITION: ***THIS IS A CUSTOM LOOSE LEAF EDITION. (THE SAME CONTENT JUST CHEAPER)! *** Book in 'Good' Condition and will show signs of use, and may contain writing, underlining, &/or highlighting within. 2nd Day Shipping Offered! All books ship same or next business day. Used books may not contain supplements such as access codes, CDs, etc. We have the best customer service online!This is the U.S. student edition as pictured unless otherwise stated. This textbook introduces management concepts in practical and comprehensible way. It not only discusses traditional management concepts but also keeps pace with the way management is changing as the business world changes. It studies how management implementation has been affected by new technologies. It has clear and concise text with interesting case studies as examples. It is an essential text as an introduction to management. This and other good quality cheap management textbooks are available to buy or rent. 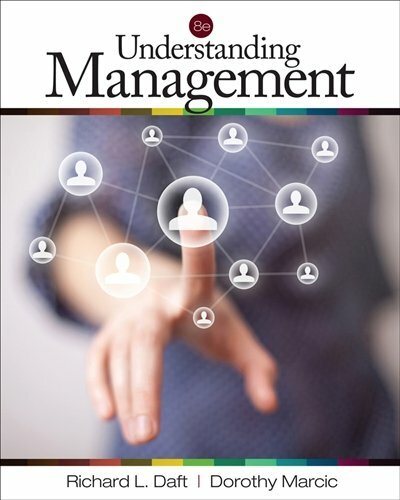 Richard L. Daft is the author of 'Understanding Management', published 2012 under ISBN 9781111580247 and ISBN 1111580243. Loading marketplace prices 151 copies from $0.51 How does the rental process work?